It’s always good to have a few cheat’s recipes up your sleeve just in case you’re really short of time. Obviously a jelly does take a few hours to set but when it comes to the actual preparation time it’s just a matter of minutes, especially if you take a short cut and use bought cordial. I should really be ashamed to be using commercial elderflower cordial when, with the blossom at its prime, every self-respecting food blogger is writing about their own home-bottled stuff but hey, this is meant to be a minimum effort/maximum impact pud. And, there’s nothing to stop you using your own cordial if you like ( I’m peed off as I was planning to harvest some blossom today, a bit late I know, and now it’s rained washing away all the fragrance). Jellies are very “in” at the moment, just take a look at the feats of the fabulously eccentric partnership Bompas and Parr. Our fascination with jelly is nothing new, the Victorians created some extraordinarily fancy jellies. My take on these fabulous puddings is much simpler, but certainly a step above the Mr Chivers variety, that I have to admit, I loved as a child (especially if I managed to sneak a couple of the rubbery squares of super-sweet gelatin straight from the box). 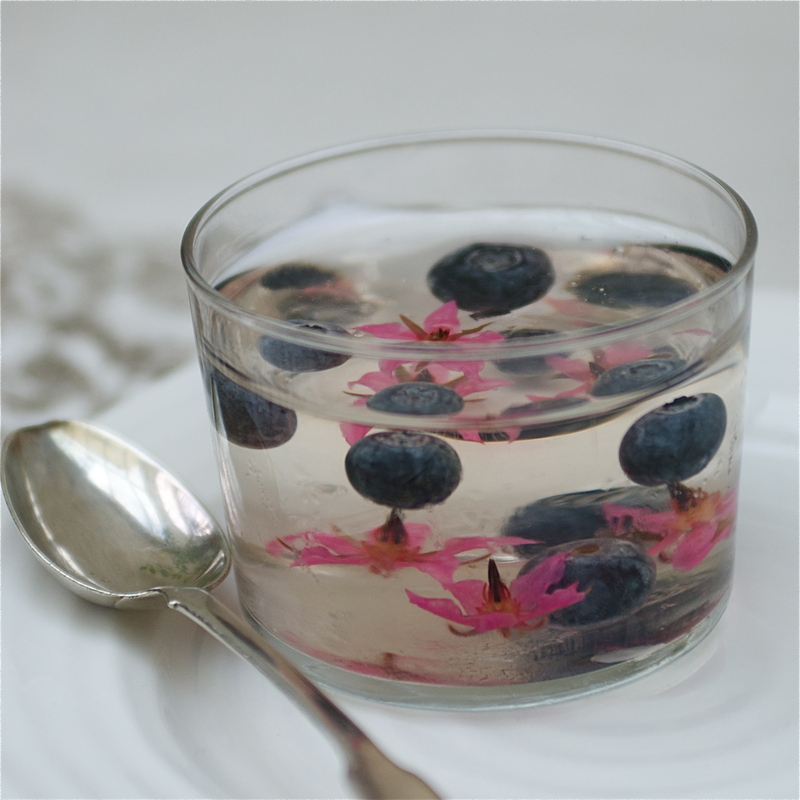 The beauty of using elderflower, or any other clear liquid, is that the fruit or flowers are magnified, and once turned out the jelly looks rather like those paper weights people used to have with dandelion clocks or scorpions lurking inside. Back in the ’70’s my sister and I created dozens of these very attractive ornaments for relatives with a wondrous kit called Plasticraft (I’m sure it must have been banned, glue sniffing would probably have been safer, the noxious fumes left you light headed for hours). Now back to the jelly; the secret is to build it in layers as the berries or flowers will always float to the surface of the liquid so if you fling it all in at once you don’t get the fabulous suspended look. Leaf gelatine is a wonder ingredient, it makes creating a jelly an absolute doddle. I do use a little less gelatin than the manufacturers advise, there’s nothing worse than rubbery jelly, so I tend to down it by about a 1/4. If in doubt start with setting your jellies in glasses and move on to turning out once you’ve cracked it. There are vegetarian jelly crystals out there too, but I’ve never been quite so excited about the texture. Check the capacity of your moulds or glasses. I love the Basque wine/cider glasses I’ve used in the picture but you might use little metal timbale or dariole moulds and turn the jelly out. I needed 1.2 litres of liquid in total. Now make up that quantity of an intense dilution of your cordial, rather sweeter and stronger than you would drink. Calculate how many sheets of gelatine you require. I’m not giving you the quantities here as different brands seem to have different size leaves (and I always reduce the gelatin to liquid ratio a little). Put your sheets of gelatin into a bowl of cold water to soften. Meanwhile heat up about 200 ml of the cordial mixture, or enough to melt the gelatin in. Squeeze the excess water from the rubbery sheets and add them to the very hot (but not boiling liquid) Stir the liquid until all the gelatin has completely disappeared and add this to the rest of your cordial mix. Give it a stir, and your done, your jelly is ready to set. Fill your glasses or moulds to about a 1/3rd full and drop in some fruit or flowers. Do think which way you will be serving the jelly, so that your flowers are the right way up. Put the moulds in the fridge to set and keep the remaining jelly at room temperature. Once the jelly is just set (after an hour or 2) you can pour on another 1/3rd of the room temperature runny stuff and sprinkle in some more fruit. Leave to set again and finally finish with the remaining jelly. This may all seem like a faff but honestly it’s quick and easy. And, if that is all too much like hard work just mix the fruit and jelly together and set in one go, it just won’t have that paperweight quality. Leave the jellies to completely set, I like to allow about 5 hours and then either serve in the glasses or dip the moulds into hot water for just long enough to melt the outer edge and turn out. Oh yes, and look what mysteriously happened to my borage flowers, a vision in Barbie pink, it must have been the acidity. Make a huge jelly for a crowd. You don’t need an elaborate mould just a mixing bowl will do as the fruit will look more dramatic in a simple shape. I’m a fan of (don’t work for!) Bottlegreen and lots of the great cordials they make, so don’t just stop at elderflower. A ginger & lemongrass jelly makes a great follow up to a Thai or Oriental meal and the pomegranate and elderflower makes a delicately blushing pink jelly. So cheat away. For maximum impact use whole berries and flowers rather than chopped fruit. I once made miniature jellies with a cape gooseberry in each – mistake, they looked like set, raw eggs.